The northern half of the Weinstrasse takes on a very different character from the southern half. Once one has gone north of Landau and the Trifelsland, the landscape changes from rolling terrain and small hidden-away 'backwoods' towns to towns out on open land or in the foothills of the mountains, much closer to major highways and therefore built to be more accessible to tourists. Also, the towns have an easier time getting their wines to the wider market. Thus, the towns are both beautiful and successful, yet those of the area around Neustadt an der Weinstrasse are still tucked away enough that the down-home flavor is still in evidence. This travelogue covers three towns that are only a few miles apart, but each are worth stopping at. 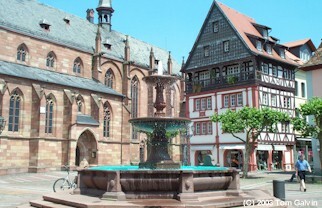 Neustadt is the largest town in the region, with a fabulous downtown loaded with medieval architecture and home to some of the grandest wine festivals around. To the north, Deidesheim is a very ritzy little town with a palace in the middle and some of the prettiest wine houses around. Wachenheim, further north, is a fabulously earthy town with yet another castle above, where I had a chance to witness a very enchanting spring festival. Neustadt was built in a gully below vineyard-covered hills topped with several impressive manors. The downtown has about five full blocks of pedestrian zone, and most of the old buildings have been well-preserved. Starting from the train station, I passed the city's 19th century conference center, the bright brown and yellow Saalbau. Crossing under the street, I encountered Neustadt's two charming parallel avenues -- Mittelgasse and Hintergasse -- tight cobblestones bounded on both sides by vine covered half-timbered houses and shops. This was primarily modern shopping, but in an adorable setting. The signature part of town was the main market square, which I came upon after turning west on Kellereistrasse. It was there that the first two pictures were taken -- that of the Scheffelhaus in the first photo and the Rathaus in the second. The former was a 16th-century Renaissance-era residence, the latter converted from an 18th-century Jesuit university building. Behind the Scheffelhaus resided the Stiftskirche, a classic sandstone church. This was the place where most of the cafés and outdoor restaurants resided, and I had my lunch there (finishing up just before a quick thunderstorm hit)! Some of the other highlights of the visit were just to the southwest of the marketsquare, where the Church of Saint Mary (Marienkirche) and the Casimirianum reside. The former was built over the canal that passes along the downtown, the latter being a fantastic white building that once served as a Calvinist highschool formerly associated with the University of Heidelberg. But, it was time to move on, and Deidesheim was the next stop. I had heard about Neustadt prior to my trip, but Deidesheim was a very pleasant surprise. This was a small but very wealthy town, with a couple of wine houses that are popular with national politicians (so I'm told). Regardless, I loved the place, and I recommend a visit there. The major structure in the town was the palace, the Schloss Deidesheim, which was a moated castle back in the Holy Roman Empire days. The moat was still there, but now hosts the castle garden, crossed over by replicas of the original concrete bridges. The palace is now a very posh bar and restaurant, and as the afternoon wore on every seat in the outdoor patio was filled with well-dressed people enjoying a glass of local wine. (Sadly, as the palace was almost completely obscured by trees, I couldn't get a picture of it.) 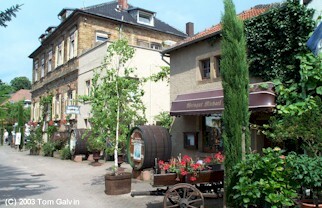 The third photo was taken of the road leading to the castle, showing the beautiful decor of Deidesheim's wine houses. Indeed, I found the array of flowers, wagons, vines, and barrels very inviting. 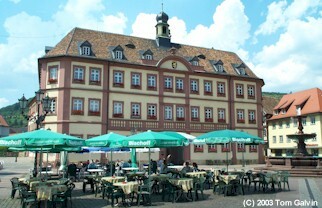 Deidesheim's central square was fabulous, too, especially for such a small town. 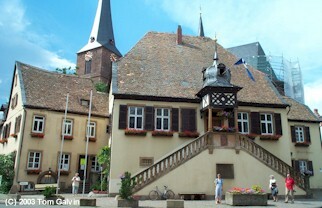 The fourth photo shows the Rathaus with the Church of St. Ulrich behind it. A popular postcard shot shows the Rathaus hosting a goat auction that happens every spring, an event that brings people by the thousands. The market square also hosts the Hotel Deidesheimer Hof, which is one of the most expensive hotels around, and one reportedly frequented by VIPs. Leaving Deidesheim and heading further north, I reached Wachenheim and immediately knew I was in for a good time when I saw the entrance to the town blocked for the wine festival, and saw great crowds inside. Wachenheim, from what I could gather, was famous as a town for sekt (sparkling wine). Like Deidesheim, Wachenheim has a palace in the center of town, but this one (the Schloss Wachenheim) is a winery and maker of a popular brand of sekt. Most of the people who were downtown had congregated in the foyer of the palace (which has a fountain with a statue of Dom Perignon, by the way) enjoying sekt and listening to live folk music on a stage. 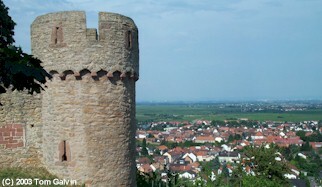 But the majority of people attended the festival were up at the castle ruins Wachtenburg, shown in part in the fifth photo overlooking the town. A live band was playing racous German party music up there, and the crowd was very thick, also enjoying local wine or freshly grilled bratwurst and having a good old time! Like so many castles in Rheinland-Pfalz, this one was permanently converted to an outdoor café or restaurant, so enjoying a glass of wine while overlooking the Rheinland valley can be done most of the year. Any one of these three towns would have been worth a quiet afternoon on their own, together I'd say they make up a very good day trip, not too far away from Autobahn 65 (which passes right by Neustadt). An additional stop that I did not make was Forst, right between Deidesheim and Wachenheim that might be worth checking out if you have additional time.